Collected into one big volume for the first time ever. 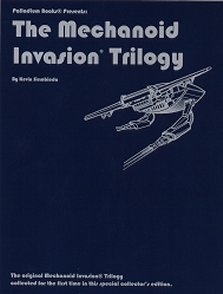 The three original Mechanoid books - The Mechanoid Invasion, The Journe, and Homeworld! A short history concerning the beginning of Palladium Books and its first RPG, The Machanoid Invasion. Conversion notes for using The Mechanoids in Rifts, Robotech, and Heroes Unlimited. A glimpse at Palladium'spast and humble beginnings. This title was added to our catalog on April 16, 2009.